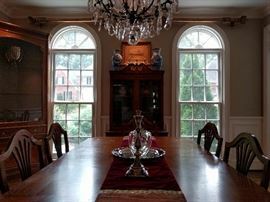 Dining room, with mahogany hanging plate rack. 1930's mahogany chest, hand painted, with marble top, measures 4' 5" W x 1' 11" D x 35" T, silver plated tea set, pair of red Asian vases, flanked by a pair of metal Italian toile wall sconces, vintage LaBarge Gilt wood mirror. 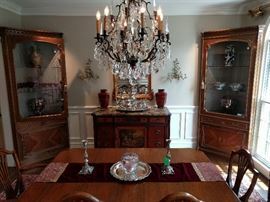 Wider view of the dining room, with an antique pair of lighted corner cabinets from Barcelona. 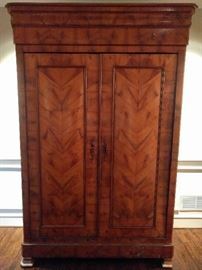 Antique French Armoire, with beautiful veneers, measures 7' 9" tall x 2' deep x 4' 9" wide. 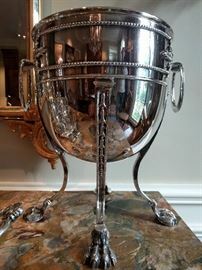 English silver plated tea set, reflected in a vintage LaBarge gilt wood mirror, flanked by a pair of exquisite French silver plated champagne coolers. 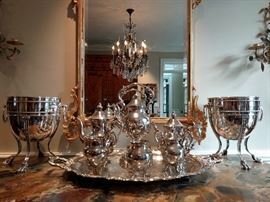 Detail of the silver plated champagne coolers. I TOLD you they were HOT! Another HUGE, well-framed French tapestry, 5' wide x 3 1/2' tall. View of the great room. 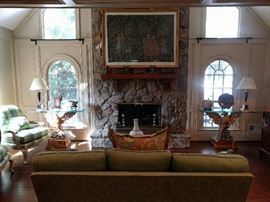 The stone fireplace is flanked pair of UNBELIEVABLE gilt wood Italian console tables, with very thick, beveled glass, L-R facing. You won't often see a pair of this quality. 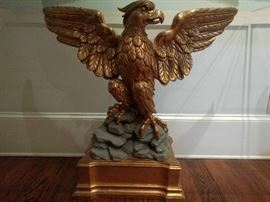 The original cost of each eagle, without the glass tops was $2K. I knoooooow! 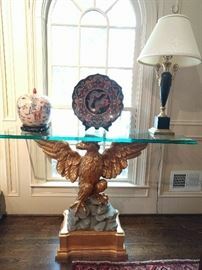 Close-up of one of the vintage Italian gilt wood eagle console tables; very thick ogee beveled glass tops. Large Asian cloisonne plate, on stand, one of a pair of black/gold metal lamps. Right facing eagle console, close-up. Beautiful pair of silk plaid, balloon-backed bergere chairs, by Wesley Hall (Hickory, NC). 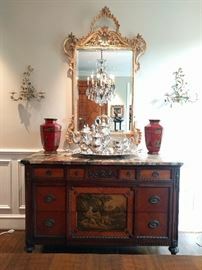 Vintage French, marble-topped chest, with five drawers between the chairs, topped with an oxblood Asian lamp. Vintage (1960's) cherry 4-drawer chest, by Kling Furn. Co. (Mayville, NY) one of a pair of Biedermeier-ish stools, vintage LaBarge brass/beveled glass coffee table, vintage Persian Karacheh gallery runner, measures 4.3 x 9.10. Vintage brass/glass coffee table, by LaBarge, attributed to P. E. Guerin; measures 38" x 17" height. Another view of the vintage Persian Karacheh gallery runner. Over the top gold mirror, with beveled glass, by John Richard; measures 4' 10" x 2' 8". Vintage cherry 4-drawer chest, by Kling Furn. Co., pair of 18" tall Asian cloisonne vases. Beautifully upholstered green damask couch, with corded gimp and fringed pillows - very sha sha sha! After an exhaustive search for a competent employee, I finally made my decision. How'd I do? One of a pair of Wedgwood design lamps, by the Crest Co., Chicago, has original shades, globes and finials. 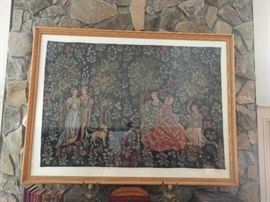 This is a gorgeous, vintage French tapestry in a huge frame; measures 6' L x 4' 8" T. Next pic has a detailed close-up. Detail close-up of the tapestry. Vintage Persian Gholtugh Bidjar rug, hand woven, 100% wool face, measures 4 x 4-8. Vintage Persian Afshar Bidjar rug, hand woven, 100% wool face, measures 2-9 x 4-7. Set/6 vintage mahogany dining chairs, by Landstrom Furn. Co.
Vintage Landstrom mahogany dining table, with two gated leaves; measures 3' 7" W x 5' 4" long x 30" T, leaves are 11" wide. 1940's mahogany china hutch, by Landstrom Furniture Co., Rockford, IL., measures 5' 5" T x 3' 2" W x 1' 4" D.
Vintage Persian fish Tabriz Bidjar rug, hand woven, 100% wool face, measures 8' 4" x 11' 6". BIG ol' blue/white Asian fishbowl, the kind you can rub to make a genie pop out. How you rub the genie once he appears is up to you. Vintage Persian Hamadan rug, hand woven, 100% wool face, measures 3-9 x 7-1. Vintage banded mahogany Kittinger dining room table, with two leaves and six chairs, 2 side, 4 arm. Gorgeous and unique 19th Century cast iron coffee table, with hand painted top and gilt swan head atop each leg. Love the hand painted detail on the top. 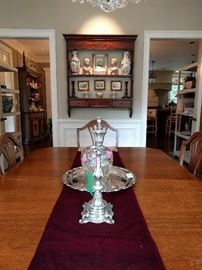 Maitland-Smith gilt & wrought iron, marble-topped table. Have you ever seen a PURPLE Persian Heriz? Now, you have. This little beauty measure 6' x 9'. Another wonderful antique English 4-drawer chest, with pencil inlay. Pair of 18" tall Maitland-Smith blue/white porcelain vases.